LaValle's re-imagining of Lovecraft brings race to the forefront, and the results are disturbing and sadly quite timely. The world Tom Tester walks through, and the trials he faces, were painful to behold. Ultimately I was far more invested in Tester's story than any of the Lovecraftian horror elements of the story, though those were well written. I cared about this man and what happened to him. My biggest hurdle came when the POV shifted halfway through - I had a hard time investing in Malone and just wanted to return to Tester's story. 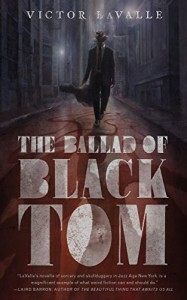 Bottom line: If you like Lovecraftian horror, but find the treatment of race in his works unacceptable, you should absolutely pick this novella up. It's a great update to an old and problematic story, and a solid addition to the genre.